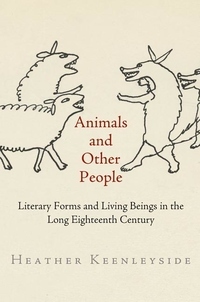 In Animals and Other People, Heather Keenleyside argues for the central role of literary modes of knowledge in apprehending animal life. Keenleyside focuses on writers who populate their poetry, novels, and children's stories with conspicuously figurative animals, experiment with conventional genres like the beast fable, and write the "lives" of mice as well as men. From such writers--including James Thomson, Daniel Defoe, Jonathan Swift, Laurence Sterne, Anna Letitia Barbauld, and others--she recovers a key insight about the representation of living beings: when we think and write about animals, we are never in the territory of strictly literal description, relying solely on the evidence of our senses. Indeed, any description of animals involves personification of a sort, if we understand personification not as a rhetorical ornament but as a fundamental part of our descriptive and conceptual repertoire, essential for distinguishing living beings from things. Throughout the book, animals are characterized by a distinctive mode of agency and generality; they are at once moving and being moved, at once individual beings and generic or species figures (every cat is also "The Cat"). Animals thus become figures with which to think about key philosophical questions about the nature of human agency and of social and political community. They also come into view as potential participants in that community, as one sort of "people" among others. Demonstrating the centrality of animals to an eighteenth-century literary and philosophical tradition, Animals and Other People also argues for the importance of this tradition to current discussions of what life is and how we might live together.